Hang the Martha Stewart Maracaibo 30 in. x 36 in. framed wall mirror in Coppered Bronze horizontally or vertically in any room to add instant class and style. 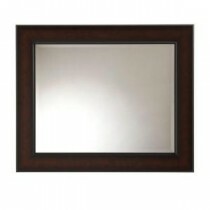 This mirror features a beveled design for depth and comes with pre-attached hanger mounts for easy installation.